Wigs.com announced Sarah-Catherine Phillips Gutierrez as the winner of their video review contest. This video encompasses what we stand for as a company. We wish to empower women with confidence through our products, and we believe Sarah did just that. 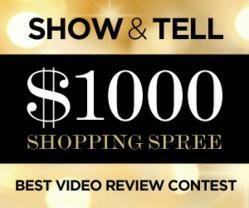 The $1000 shopping spree winner is Sarah-Catherine Phillips Gutierrez. Wigs.com announced the winning video for best video review on February 24, 2012. “This video encompasses what we stand for as a company. We wish to empower women with confidence through our products, and we believe Sarah did just that,” said Marketing Director, Kristen Boozer. Sarah-Catherine Phillips Gutierrez chose to review the Sky by Noriko wig. The winning video was selected because of its artistic and out-of-the-box product review interpretation. Although the wig was not verbally reviewed, the contestant did use a slideshow of photographs to capture the essence of her meaning. “A picture really is worth a thousand words,” said CEO Carliz Sotelo Teague. Gutierrez has been wearing wigs since she was a child because she suffers from the illness Alopecia. “If [my hair] were to grow back again, I think I would probably just shave my head and continue to wear wigs,” said Sarah-Catherine when asked about ease of wearing wigs. She was interviewed by Wigs.com; the interview has been posted on their company blog. When Wigs.com invited customers to submit their video reviews they received a unique variety of video reviews from both men and women. What they didn’t expect was to be so thoroughly inspired by Sarah-Catherine’s winning video. “For me, I’m now used to wearing wigs and I enjoy wearing them… [The contest] was a great opportunity to be a little bit of a service in that way [to others].” Her winning entry for the Show & Tell – Best Video Review Contest winner has been posted at Wigs.com along with a mini gallery of the runner-up videos.